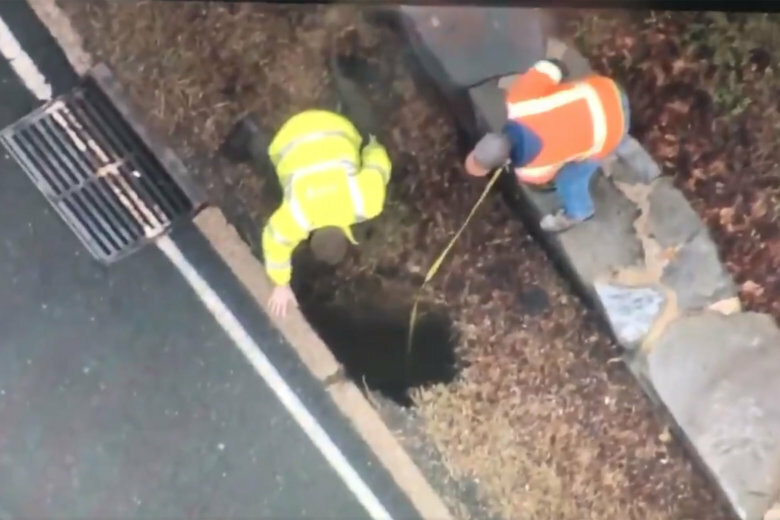 The George Washington Parkway has fully reopened to traffic Saturday after disruptive closures caused by a large sinkhole that compromised the road Friday morning. The George Washington Memorial Parkway has fully reopened to traffic Saturday after disruptive closures caused by a large sinkhole that compromised the road Friday morning. “We worked through the night to address drainage issues and fill in a large sinkhole that was 10-foot deep, 12-foot wide and 30-foot long,” Jonathan Shafer of the National Park Service said. For about four hours Friday morning, a portion of the Parkway was closed in both directions between Virginia Route 123 and the Beltway near the American Legion Bridge. The sinkhole was discovered before 6 a.m. in the northbound lanes near Dead Run. After assessments determined the southbound lanes were safe, traffic resumed flowing southbound about 10 a.m.
Shafer said road repairs wrapped up sooner than expected after a damaged stormwater drainage pipe was replaced, the hole filled in and more than 350-square-feet of new asphalt laid down in the area. The National Park Service will monitor the repaired area for settling and fix the damaged median in coming weeks. Drivers should expect single lane, overnight closures then, for that work.